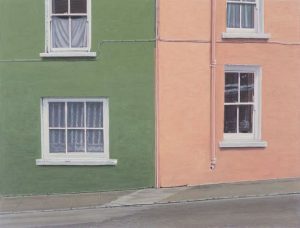 THIS has been the best year ever on the Irish art market in terms of turnover and it continues on its merry way in the final run up to Christmas. 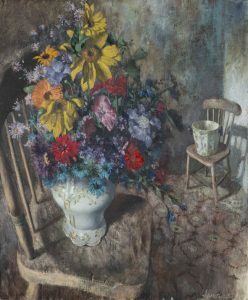 The James Adam sale of Important Irish Art in Dublin next Wednesday evening offers a selection that includes leading lots by Oisin Kelly, Roderic O’Conor, Gerard Dillon, Augustus John, Michael Farrell, Erskine Nicholl, Louis le Brocquy and Henry Moore. 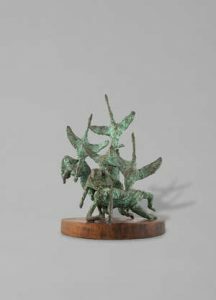 The top estimate in this auction is for Oisin Kelly’s bronze Children of Lir cast in 1983 at the Dublin Art Foundry as an issue of two. It is from the original maquette for Kelly’s large scale bronze at the Garden of Remembrance in Dublin dedicated by Taoiseach Jack Lynch in 1971. The other copy is on display outside the Taoiseach’s office at Government Buildings. This one is estimated at 30,000-50,000. A bronze relief of a mother and child and reclining figure by Henry Moore is estimated at 12,000-16,000. The catalogue cover lot is another sculpture, F.E. MacWilliam’s Peace B from his Banners series (8,000-12,000) and there is sculpture by Rowan Gillespie, Rory Breslin, Imogen Stuart, Robin Buick, Edward Delaney, Eamon O’Doherty, Selma McCormack and James McIntyre. 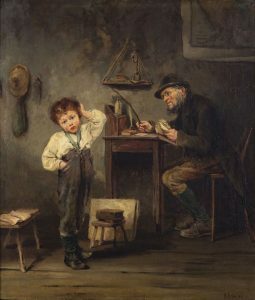 This entry was posted on Sunday, December 2nd, 2018 at 10:46 am	and is filed under ART, AUCTIONS. You can follow any responses to this entry through the RSS 2.0 feed. You can leave a response, or trackback from your own site.